Your Dog will love Cozy Camp!!! We have found that this has become a nice addition to the high quality boarding care our visitors have enjoyed for many years! "Cozy Camp" is all about fun! 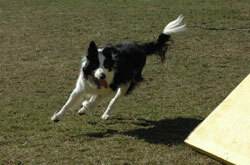 It is an active and happy environment for your dog - play time is given solely to your dog with one of our staff members. "Camp" Time consists of a one hour session--your dog will go out to our 1/2 acre fenced in play yard and spend one-on-one time with one of our "Camp Counselors". can run, play ball, can chase a frisbee, jump hurdles, run through tunnels, play in wade pools, choose from an array of toys or roll in the grass in the shade of a tree. Cozy Camp Day Camp sessions can be reserved along with your dog's scheduled boarding visit with us!